Former police officer Eric Sloan Parker pleaded not guilty to a federal charge of violating the civil rights of an Indian grandfather, left partially paralyzed after officers slammed him to the ground during a February arrest. Appearing before the federal magistrate in Huntsville, Alabama, Parker entered a plea of “not guilty” to the charge of felony civil rights abuse, brought against him by the FBI last month. If convicted, he could face 10 years in prison. The 26-year-old former police officer from Madison, Alabama also faces a misdemeanor assault charge in Limestone County, which could put him in jail for up to a year. Parker is currently free on a $5000 bond, and will face trial on June 1. A civil case against him by the family of the injured man has been put on hold until the criminal proceedings are resolved. Madison police released recordings of a call reporting a “skinny black guy” with a knit cap walking around an affluent neighborhood and peering into garages, on February 6 in the morning. Parker and two other officers approached the man, later identified as Sureshbhai Patel, 57. An Indian national who came to Alabama to help his son and daughter-in-law with their firstborn, Patel only spoke Gujarati, and tried to tell the officers he was minding his own business. “No English. Indian. Walking,” he said, according to his son Chirag’s statement to the local media at the time. Dashboard camera footage released by the police shows Parker slamming Patel on the ground. 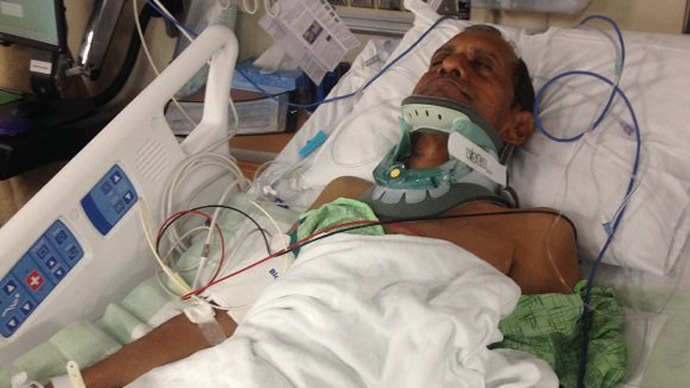 Suffering a neck injury from the impact, Patel was unable to move on his own and was taken to the hospital. Doctors said that without the emergency surgery he would have been permanently paralyzed, Chirag Patel later told AL.com. Sureshbhai Patel had no health insurance, but a GoFundMe.com campaign established to pay for his medical expenses has raised nearly $210,000. His recovery has been slow and painful, the family says. Madison is a town of about 46,000 people in northern Alabama, 10 miles west of Huntsville, and is known for high-tech, aerospace and defense industry. The TechAmerica foundation lists Huntsville/Madison County as the second-highest concentration of high-tech workers in the US, after California’s Silicon Valley.